If you’re living in town, then you probably have city water and sewer. All you need to worry about now is paying a small bill every month. But once you move to the country, you’re on your own. Don’t worry, though. Most of the time these systems work just fine. Still, before you buy a home or cabin, it’s important to know about its septic system. Repairs and upgrades can be expensive. Here’s a quick overview; to really understand septic systems thoroughly, you may want to do an online search on some of these terms and read further. The first question you should ask is what type of system a particular home or cabin has. There are three main types: conventional, mound, and holding. You may also hear about something called a “separate gray water system.” One other term I’ll explain briefly is “perc test.” You’ll want to know what it is and why it’s important. A conventional septic system runs waste water and solids into a large concrete septic tank where bacteria digest the solids. Liquids run out the other end into a drain field that’s made of perforated pipe buried in a gravel-filled trench. Solids that don’t digest settle out into a sludge at the bottom of the septic tank. Every two or three years, you’ll need to have this sludge pumped out. It’s not expensive, and it’s no big deal. It’s just part of owning a home or cabin that’s outside the city limits. A mound system is similar, except that the drain field is above ground level, inside a large mound of gravel and dirt. It’s used in certain special conditions—most often when the soil isn’t permeable enough, there isn’t enough soil before you reach bedrock, or the water table is too close to the surface. Although the mound can be landscaped in a way that makes it less noticeable, it’s still going to be there. Another negative is that mound systems often require a pumping system in between the septic tank and the drain field. Otherwise, these systems work just like a conventional septic system. A holding tank is just what it sounds like—a holding tank that needs to be pumped out as soon as it’s full. I see them most often at older lakeshore cabins. They’re usually only used for sites that are unsuitable for either a conventional or a mound system. Sometimes, however, they were installed because they were a less expensive alternative. As you’d expect, a larger tank is better. But it still needs to be pumped out eventually. And when it is, a large tank will cost more to empty. You may be able to upgrade a holding tank to conventional or mound system. But even if you can, it will be a fairly expensive undertaking. Meanwhile, pumping out the holding tank will be a regular expense. If the system serves a small cabin that’s only used on a dozen weekends every year, that’s less of an issue. But if that cabin becomes a full-time, year-round home for a family of six, then you’re going to have a monthly pumping bill. To help with that problem, some homes and cabins have a separate “gray water system.” (You’ll also see them used in conjunction with conventional and mound systems.) Gray water, as opposed to “black water,” is all the waste water that hasn’t come from a toilet. Depending on local codes and regulations, your gray water can sometimes be released with little or no processing; you could even use it to water your lawn or garden. Just be careful about what soaps you use, and avoid pouring too many household chemicals down the drain (probably a good idea anyway). Finally, here’s one more term you should know about. If you’re building a new home or cabin, you may hear about something called a “perc test.” That’s short for “percolation test,” and it’s a measure of how permeable your soil is. If your building site is on clay soil that’s relatively impermeable, it could mean you’ll need a mound system or holding tank. If it’s on relatively sandy soil, you can relax. You’ll probably pass your perc test with flying colors. 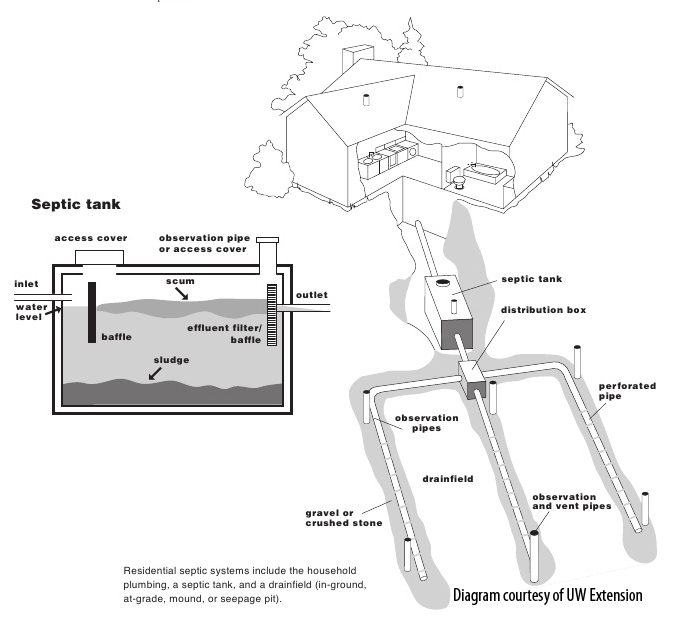 More about septic systems from the Wisconsin DNR. ← Buying a lake cabin – what to know about wells?